Posted in Arts on September 22, 2014 by Shonali Ganguli. The Hofesh Shecter Company’s tour of India came to end on Saturday 20 September 2014 in Chennai with audiences country-wide exhilarated with Political Mother, talking not only about the show’s powerful message but also its spectacular presentation. Lawrie McLennan, Technical Manager, Hofesh Shechter Company, on what goes into making Political Mother the audio-visual marvel it is. The performance has been repeatedly referred to as an audio-visual marvel, what are the various technical aspects that make this possible? The biggest factor in this is that Political Mother is a tightly-drilled, and well-oiled machine. Every last detail has been rehearsed and re-rehearsed to get the timings finely tuned to complete accuracy. The lighting and sound departments work to 1/24th of a second accuracy. 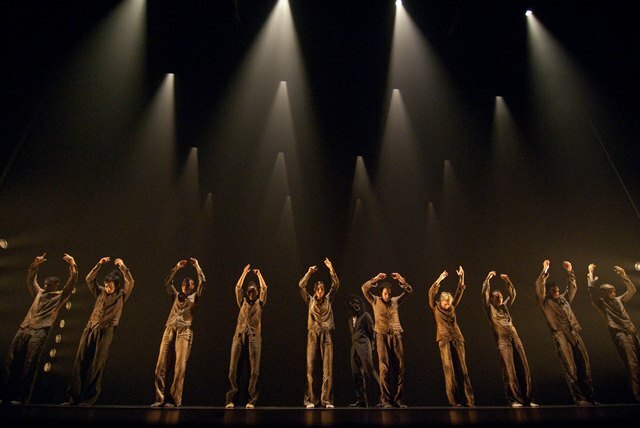 All the lighting and sound cues are carefully synchronised together by the computerised control systems that Hofesh Shechter Company tours around the world. There are more than 150 lighting cues from start to finish of the show that all are triggered automatically. This is what allows the lighting design to let Hofesh’s cinematic style editing of the show really work. It is the combination of having the eyes and ears assaulted at the same time, the music gets loud at the exact split second the stage goes black. It is overwhelming on the senses. There are more than 160 lights hung above, to the side and in the stage. We use a sound system that is capable of making even the most loud and heavy rock band sound excellent. We have up to 4 smoke machines making the hazy smoke that you see when you first enter the auditorium and that allows the lighting design, by Lee Curran, to sculpt the air around the stage into so many different landscapes and scenes, even without any real scenery on the stage. The stage set up looks complex, what are the building blocks here and how long does the entire process take? The total set up time for one performance of Political Mother is in excess of 400 man hours. This includes the lighting and sound technicians, the carpenters and stage managers, the dancers and musicians, the rehearsal and technical directors. This happens over two days. The technical set up starts in the morning the day before the show. The stage is made up of a steel platform construction at the back of the stage where the musicians play. In front of this is a black net curtain that combined with the lighting and the smoke allows us to choose exactly when you see the musicians at the back, and exactly when you don’t. There are 35 lights and 13 microphones hidden inside the musicians platform. Then around the stage there are 70 sidelights that accentuate the excellent dancers, and a further 60+ lights hanging above the stage. There is a stage management team that works very hard behind the scenes all through the performance to help the dancers on and off stage in the pitch black without running into any curtains or lights. How many hours of rehearsal are required for the sound and lighting to ensure everything is in sync. Every city that Political Mother goes to we have 5 hours of lighting and sound rehearsal. All the dancers and musicians move through their motions of the show, standing in the right place. They put little marks on the floor that glow in the dark so that they know they will be standing in exactly the right places even before the lights come on. We look at every lighting cue and edit it to make it look just right. We listen to many sections of the show with the musicians playing and get the sound just right. After all that we make a full rehearsal from start to finish of the entire show, all before the audience arrives. The musicians in the background, what kind of instruments do they play? We have 7 musicians in total. 5 of them play both guitar and drums. The other 2 are drummers throughout, playing even when you can’t see them during the show. There are 4 electric guitars and 1 electric bass guitar. We have 3 snare drums, 1 tom-tom drum and 1 kick drum that is played on end like a normal tom-tom drum. There are also 2 sets of cymbals that get moved around and played by different musicians. A version of this interview was published in The Hindu. Posted in Uncategorized on September 11, 2014 by British Council India. 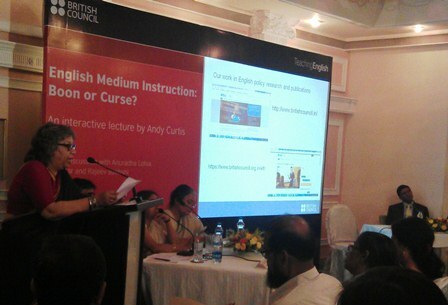 The taxi-less roads did not deter ELT whizzes and exponents in Kolkata, who went on a linguistic, educational and cultural overdrive with a lively debate on ‘English Medium Instruction: Boon or curse? that followed an engaging talk by Prof. Andy Curtis on the subject. Andy Curtis is Professor in the School of Graduate Education at Anaheim University, California and the president of TESOL International. His talk, on 11 August in Kolkata and 13 August in Patna, took great care to present research related to the two opposing schools of thought, viz. the perceived position of English as the ‘language of inclusion’ vs. the possibility of it being the ‘language of intrusion’. He elaborated on the historical and political significance of the EMI debate in India, with particular reference to India’s colonial past, while also highlighting how the various Indian Englishes have contributed to keeping the language a ‘living, breathing organism’. Prof. Curtis stressed on the need for a strong debate on EMI in India. The panel discussion and the audience response turned out to be a thought-provoking session, with a combination of long-standing views of the Indian education system and progressive comments on the pertinent impact of technology, globalisation and India’s presence as a multi-lingual and multi-cultural expanse with an internationally competitive edge. Prof. Anuradha Lohia, Vice-Chancellor, Presidency University, pointed out how several generations of Indian school-going children learnt English ‘by default’ without there being any choice in the matter. She acknowledged that more and more learners of this generation had the option of continuing education in their chosen language, but higher education demands a knowledge of English. She attributed this scenario to the fact that English is the language of research and development, therefore a ‘language of necessity’ for young people who will soon become global citizens. She also put forth an interesting question of whether lack of English could become an impediment for those aspiring for a career in technical fields, or if they could still make it big in the international arena. The Director of Modern High School for Girls in Kolkata, Ms. Devi Kar, responded to Prof. Curtis and Ms Lohia by raising the question of whether English might also be seen as the ‘language of exclusion’, especially in higher education. From her own experience of teaching and learning, Ms Kar pointed out how pronunciation and accent formed the ‘great divide’ for Indian English speakers, by bringing up the long-ensuing war between substance and language style. The crux of Ms Kar’s response was based on bilingual language teaching and how it was a more organic way of teaching languages in India, especially due to the need for constant code-switching and code-mixing in the diverse linguistic panorama. Academic Manager of British Council Teaching Centre in Kolkata, Mr Rajeev Bakhshi, took on the debate of the purpose and need for English learning in India, by emphasising that students in the English classroom looked upon English as a means of seeking better jobs or securing a better future for themselves, not only in terms of monetary benefit, but also for more promising careers and a global identity. The audience posed questions on a number of issues ranging from how English is taught in schools, to which Prof Curtis responded by saying that the current style of grammar-focussed teaching can limit linguistic creativity to a great extent. To another question on how English language is linked to ‘who we are’, Prof Curtis advocated the ideology of plurality while pointing out the fossilisation of language and clear markers of an individual’s identity, influence how we speak. The stimulating discussion ended with a consensus that despite the ambivalence towards EMI globally, multilingualism is the way forward. Prof Curtis encapsulated this belief with the comment ‘diversity is strength’ and Sujata Sen rounded off session by saying English language learning is indeed a boon in India and the debate on EMI should continue, in interest of betterment of education in India. The debate continued in Patna where a turnout of 86 people on a day it rained very heavily included a mix of senior education policy makers from SCERT (director and his deputy, VC of Patna University), teacher educators from our own BLISS project, Pratham Bihar unit (including their state head), several school principals from our schools network. A lively interaction followed the lecture, with questions of linguistic imperialism and dangers of English cropping up (and tackled very well by Andy). The discussion was moderated by Debanjan Chakrabarti. 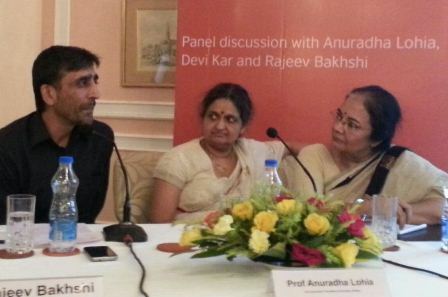 Both events were covered very well in the mainstream media (the Telegraph, Hindu, Hindustan Times, several agencies). 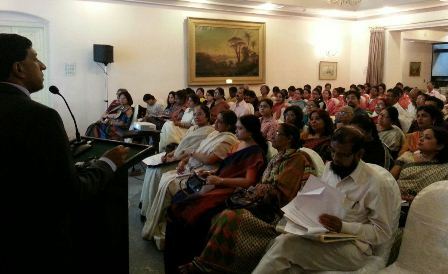 This was the first in a series of programmes that strategically brings together our work in research and publications, particularly on the (tricky) issue of EMI and related pedagogic approaches, aligned to our state partnership programmes and looking at the medium term milestone of the Language and Development Conference late in 2015. Posted in Uncategorized on September 5, 2014 by Shonali Ganguli. Hofesh Shechter Company, one of the UK’s most exciting dance groups, makes its debut this week in the Pearl City, Hyderabad. With excitement building inside we waited at the Kamaraj International Airport, Chennai, to welcome the musicians who were on a nine-hour flight from London. The group arrived and appeared as excited as us and raring to go. Norman, the leader of the group, was a storehouse of energy apparent in the way he moved around. Dominic Goundar alias Raju was excited to be touching home base. Probing him about the roots of his name, we were absorbed by the story about his forefathers being from the South of India, then they moving to Fiji, Australia and later settling in the UK. Joseph Ashwin, the last name, you ask curiously. Well, that’s just an ironic coincidence he says, and I get that a lot. Jo then goes on to elaborate the incident at an Indian store when the shopkeeper assesses him against the identity card… nothing like an ‘Ashwin’ he says and no connection to India. At the breakfast table, the troupe eagerly experiment with dosas! They are excited about their debut in India and are rehearsing meticulously and we are more than excited to watch them at Shilpakala Vedika on Friday! The tour starts today and it is gaining momentum with every passing hour…. Hyderabad, be ready to be awestruck and held spellbound. British Council launches Impulse – Contemporary dance from the UK, Season 2 with a performance of Political Mother by Hofesh Shechter Company. For more details visit www.britishcouncil.in/impulse2. Posted in Arts, Uncategorized on September 4, 2014 by British Council India. 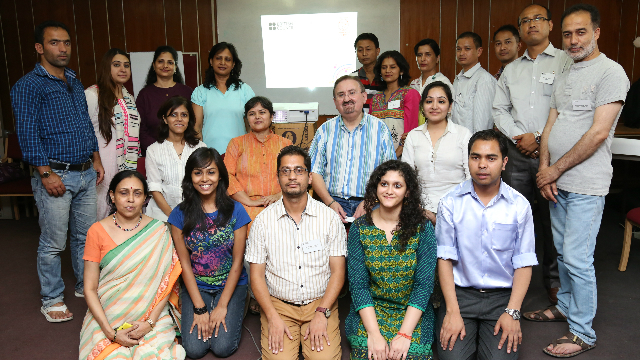 The World Voice Project 2014 kicked off in Delhi with training for state level trainers from five states of India. 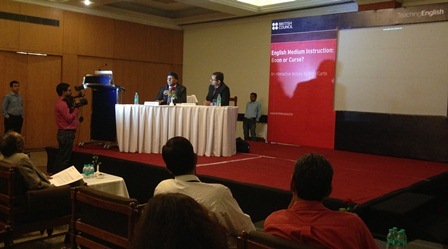 The workshop was hosted with our partners at the NCERT and was attended by Gill Caldicott (acting Director), Sujata Sen (Director, East India), Vivek Mansukhani (Director Arts) from the British Council, Prof Parvin Sinclair (Director), and Dr Pawan Sudhir (Professor and Head, Department of Education in Arts and Aesthetics (DEAA) and Dr Sharbari Banerjee (Assistant Professor, Musicologist) from the NCERT. The three-day World Voice Project workshop (25 – 27 August 2014, DEAA Conference hall, NCERT New Delhi) for Master Trainers brought together 16 participants from each of the WVP partner states: Himachal Pradesh, Jammu and Kashmir, Meghalaya, Sikkim and New Delhi. Aiming at capacity building, training and skills advancement on Art Integrated Learning (AIL) with music and singing through British Council India’s World Voice Project (WVP), it offered an ideal platform for interaction, an exchange of best-practices, experiences, song repertoires, opportunities and challenges involved in AIL through music. The interactive training was conducted by the resource person and trainer from United Kingdom, Dr Thomas Ian Young. He shared a range of new warm ups, singing games, use of puppets and actions with songs and encouraged sharing of personal song repertoires from the participants. The participants learnt 12 new songs during the workshop, including songs from the WVP songbooks alongside others from across the world such as, Canoe song (North America), Si-Si (Congo), Scotland and so on. They enjoyed singing and learning the songs, while they also shared their WVP experiences in their respective states through presentations, video and audio clips, as well as, photographs documenting their work. They highlighted how teaching through WVP songs had made classroom learning more enjoyable and interesting! The participants attending the current workshop had been trained earlier by Master Trainers from New Delhi/ India over the past one year (October 2013 – March 2014) in their respective states. The current training was envisaged to help participants enhance their skills to be able to conduct similar trainings in their educational institutions and states; thus, taking on the role of master trainers in their respective regions. Further, in an effort to promote AIL through theatre, the British Council India organised short sessions on ‘Theatre in Education’ with the support of 4 short listed participants trained previously during the Royal Shakespeare Company (RSC) workshop (held in January 2014) alongside this workshop. The hour-long theatre presentations with a focus on Shakespearean texts were scheduled before and after completion of Dr Young’s sessions during the ongoing workshop. The participants enjoyed the fusion of music and theatre sessions for classroom learning. The theatre component will be included in the next phase of the AIL activities in the various WVP partner states.